Waitiki is dead, long live The Waitiki 7! Despite the sharing of members from Waitiki, this is a new and different band. But although the tone may change, but the music is still great either way. Think of Charred Mammal Flesh as an impromptu jam session among friends at a private barbecue while New Sounds of Exotica is how the same friends (along with a few who missed the party) play for a big club gig. Following their 2009 release, Adventures in Paradise, New Sounds of Exotica offers takes on both classic and original material and a wide variety of exotic instruments. In addition to the standards like the guiro and vibraphone, there’s a hulusi, guiro, claves, xylophone, glockenspiel, and more! Things start off with a bang thanks to Coleman and Clar’s “Similau.” Vibraphone beats, coupled with wild monkey shrieks and cymbals, lead into a bongo/vibe fusion. Next comes a piano and bird calls. It should be noted that the band member responsible for the animal calls, Lopaka Colon, is the son of Augie Colon (who provided such effects for Arthur Lyman). It then launches into a fast-paced, clave-filled “Latin” melody pops that’s further enhanced by a violin before returning to the original style. This album’s version of “Flower Humming” is even smoother than the first Waitiki version and is one of several musical ways The Waitiki 7 shows they aren’t Waitiki anymore. There’s more drums this time around, as shown by the opening, as there’s a distinct lack of reeds/saxophone play. Guiro and piano come into the mix, while a flute helps bring it to a faster pace in middle and towards end of the song. Cymbals come into play there as well, along with a vibraphone or xylophone. “Bali Ha’i” is quite expanded compared to the original, especially the opening. Said opening has a “happy tropics” feel to it. However, there are no vocals this time around. Chimes then bring us to a good approximation of the “sci-fi” sounding bit in the original via vibraphone. Bongos come next in a funky, almost Latin at times, beat. It’s definitely not like slow, seductive pace of the original, but it’s still great. Besides, it does slide back into style of original towards the end. Their version of Martin Denny’s “When First I Love” has a slow build of bass and bongos to the use of a violin and the occasional piano riff. There’s also use of maracas or guiros along with a piano/vibe combo woven in and out of song (guest musician Greg Paré provided vibraphone duties for this song). It definitely has the feel of looking back on old memories. Martin Denny’s “Voodoo Love” kicks off with a cymbal clash and quickly starts a fast, frenzied bongo beat. The bongos, piano and sax get overlaid and the saxophone later dominates. That is, until the bongos come back for awhile and team up with drums/cymbals. M. Parish’s “Ruby” makes light use of a violin, coupled with chimes, vibes, and maracas. Lopaka Colon’s bird calls and monkey hoots add to the effect of a relaxing jungle stroll and must make his old man proud. “China Fan” kicks the original up a notch in its opening. Said opening consists of gongs (or is it ocean drums), bongos, an Asian flute, violin and subtle guiro use. Chimes are scattered through Paré’s vibe work, including an amazing vibraphone solo, while the ever pervasive saxophone and piano also come into play. It’s the same song as before, but different and still as relaxing as ever. The drumbeats and fast-paced vibraphone of “Firecracker” (another Denny classic) sound like running cartoon mice. The use of cymbals is also speedy and wild, like the fuse on a firecracker. The pace slows down with drums and cymbals for a bit, but the drumbeat builds up to heavy use of cymbals. This is followed by a vibraphone beat that builds up to big bang…just like a real fireworks display. The final track, “Sweet Pikake Serenade,” has soft opening piano accompanied by bird calls. Light vibes and new (to this version) piano flourishes add to the beautiful play-out. It really is like a memory of days gone by. Doing this series has exposed me to multiple versions of the same (or similar-sounding) songs and I must say that it’s very interesting to hear how something can be familiar and yet also have a unique take on it. As you can see, there’s more to the brand than just great music. 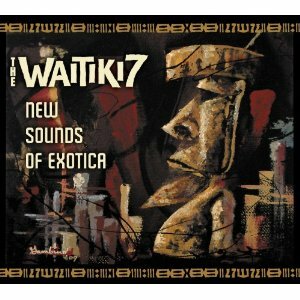 So if you loved Waitiki, get New Sounds of Exotica. If you hated Waitiki, get it anyway. You’ll be pleasantly surprised by what you hear. Special thanks to Randy Wong and Waitiki International for the review copy!